The Blackmoor Reserve lies in the heart of the historical lead mining area on the Mendip plateau and includes a special mix of habitats including pools, wet woodland, spoil heaps and heathland. The mine closed for the last time in 1885 and looking at it now it is hard to imagine how it might have appeared when operational. We considered ourselves fortunate to have evaded the persistent rain that had dogged much of the winter and in fact the bryophytes were in perfect condition, hydrated but not soaked. Blackmoor is at around 300m altitude and is exposed, as we discovered when we set out into a chill wind. Starting with hands-and-knees bryologising on the black metalliferous spoil, we were rewarded by dark red cushions of Ceratodon purpureus, growing with Brachythecium albicans and Polytrichum juniperinum. The spoil is a highly hostile environment for plant growth: it desiccates rapidly, is very acidic, low in nutrients and toxic, so a rather specialised plant community is found there. One liverwort that seems to thrive, however, is Lophozia excisa, which was tricky to identify in the hand as most of its characteristic red leaf gemmae had been washed off by rain. The pretty little moss Bryoerythrophyllum ferruginascens was also present en masse, tinging the ground orange. Sciuro-hypnum populeum was a new species to many, but it was Grimmia donniana on large black vitreous boulders nearby that drew the most admiring remarks. Known from Blackmoor for many years, this montane species is very rare in southern England. 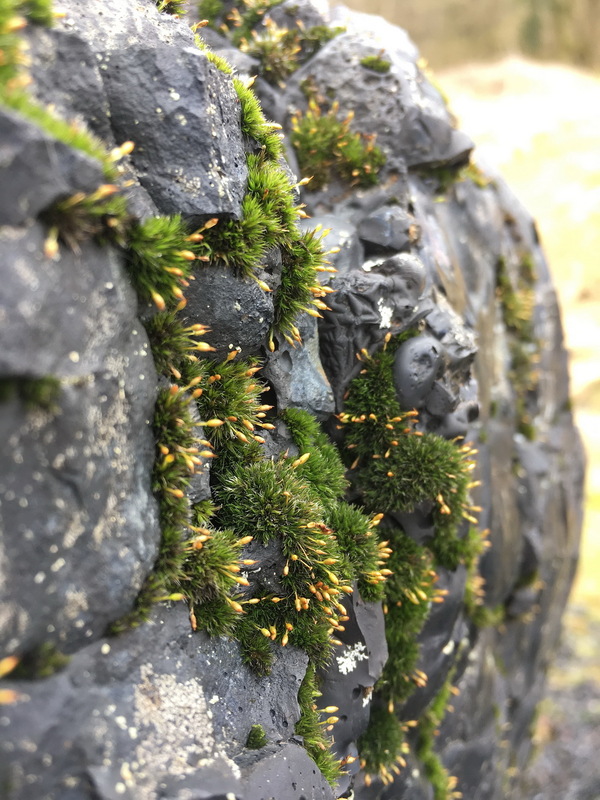 However, on these boulders there must be literally thousands of plants, which had young sporophytes and were delightfully photogenic. After admiring some wonderful cushions of Orthotrichum pulchellum, O. striatum and Ulota phyllantha growing on trees we paused to pay homage to cushions of Ptychomitrium polyphyllum, on vitreous pebbles nearby. After pausing for lunch, we headed into a wet part of the reserve, where woodland has grown up around a stream and an old settling pond. Plagiomnium elatum was present in shallow water of the pool, easily identified by its broadly decurrent leaf bases. A search for Colura calyptrifolia on tangled Salix cinerea overhanging the water nearby was not easy but two colonies were found, one of which had perianths. Splendid populations of fruiting Rhizomnium punctatum and Fissidens adianthoides were present in the wet ground nearby. A slender-looking Brachythecium on a tree nearby caused some excitement as it was thought to be a possible candidate for the elusive B. velutinum, a species that is supposed to be common, according to the books, but which few of us have ever seen. Sadly it just turned out to be an arboreal Sciuro-hypnum populeum. Moving into drier woodland, we admired Homalia trichomanoides on ash trees and Nowellia curvifolia on decaying wood. A large cushion of Tortella tortuosa growing on a tree trunk caused some debate as this is an unusual habitat for this species. At the end of the reserve an old and completely bryophyte-covered drystone wall offered some typical limestone species that we’d not seen earlier. Colours and textures contrasted beautifully where Anomodon viticulosus, Neckera complanata and Porella platyphylla grew intermingled. On the way back to the car park we were distracted by yet another epiphyte-rich sprawling willow. However, this one had a large cushion of a distinctive-looked Ulota with a much longer seta, a dark-tipped calyptra and more mature capsule than its U. bruchii neighbours. This turned out to be Ulota calvescens, a charming little epiphyte that is spreading from the far west into our area. And so ended a very enjoyable and satisfying day. Despite this area having been worked quite recently by myself and other bryologists, our group still managed to find several species that had not been recorded there before.